This post is part of my reflection on an upcoming talk I’m giving at Douglas College about open pedagogy: “What’s Open about Open Pedagogy?” In my previous post I started collecting some examples of activities that people have put under the umbrella of open pedagogy. In an earlier post I collated a number of definitions of open pedagogy, and in my next post I plan to dig more deeply into what I think open pedagogy is and what might be “open” about it. Here I’m going to do a short reflection on possible differences between “open pedagogy” and “open educational practices” (OEP). I have used open pedagogy and OEP interchangeably in the past, and I’m now thinking it might be helpful to consider where they might differ. The following are not in chronological order, but rather an order that makes some logical sense to me as a way to build towards a difference between open pedagogy and OEP. OEP are defined as practices which support the (re)use and production of OER through institutional policies, promote innovative pedagogical models, and respect and empower learners as co-producers on their lifelong learning path. They address the whole OER governance community: policy makers, managers/administrators of organisations, educational professionals, and learners (p. 4). This is the same definition of OEP given in the Open Educational Practices Report by Andrade et al. (2011) (p. 12), which is not surprising since Ehlers was one of the authors of that report. [According to Ehlers (2011),] Open educational practices . . . involve the use and creation of OER in courses where learners are collaborators and co-producers of the curriculum. Thus, “[t]he pure usage of … open educational resources in a traditional closed and top-down, instructive, exam-focused learning environment is not open educational practice,” according to Ehlers (2011, p. 5), but doing so in the context of a course where students revise such materials and act as collaborators and co-producers of curriculum is. So here, the idea is that open educational practices involve more than content: they involve using OER in courses that provide opportunities for participants in those courses to contribute to the curriculum and shape their own learning. This sounds fairly close to how some people have defined open pedagogy, though. See one of my posts earlier this year on open pedagogy for a list of various definitions of open pedagogy and how I’ve tried to group them under categories. Open education practitioners and researchers describe OEP as moving beyond a content-centred approach, shifting the focus from resources to practices, with learners and teachers sharing the processes of knowledge creation. Open educational practices (OEP) is a broad descriptor of practices that include the creation, use, and reuse of open educational resources (OER) as well as open pedagogies and open sharing of teaching practices (p. 16). But still, she states that a variety of scholars have discussed practices she calls OEP under multiple theoretical frameworks, including “open teaching (Couros & Hildebrandt, 2016), open pedagogy (DeRosa & Robison, 2015; Hegarty, 2015; Rosen & Smale, 2015; Weller, 2014), and critical digital pedagogy (Stommel, 2014)” (p. 18). So how some describe open pedagogy may be similar to how she describes OEP. collaborative practices that include the creation, use, and reuse of OER, as well as pedagogical practices employing participatory technologies and social networks for interaction, peer-learning, knowledge creation, and empowerment of learners (p. 18). This does fit with a number of views of open pedagogy I’ve seen, where students and faculty engage in cooperative knowledge creation, use social networks for interaction, etc. 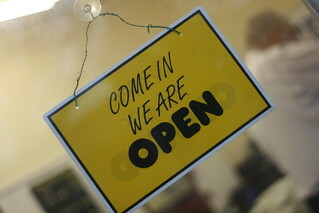 … open education is not limited to just open educational resources. It also draws upon open technologies that facilitate collaborative, flexible learning and the open sharing of teaching practices that empower educators to benefit from the best ideas of their colleagues. It may also grow to include new approaches to assessment, accreditation and collaborative learning. Understanding and embracing innovations like these is critical to the long term vision of this movement. This is a pretty broad view of what we might call open educational practices, and helps me think about how perhaps OEP could be broader than open pedagogy. 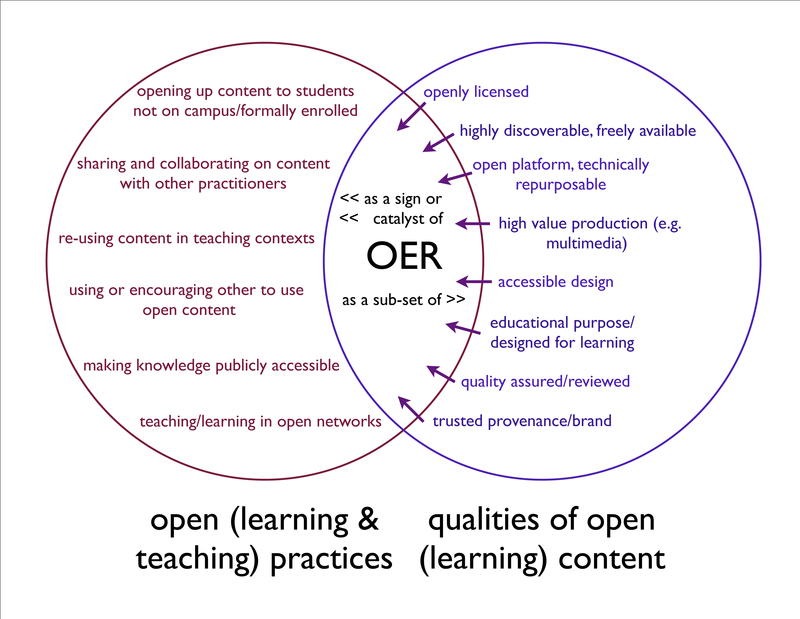 This Open Practices Briefing Paper from the UK OER project (written by Helen Beetham and others has a nice explanation of how we might think of the differences between open pedagogy and open educational practices, in the “Open Practices What” section. A number of these do certainly seem to go beyond “open pedagogy” as I have often heard it defined (though there are probably definitions of open pedagogy that include these things too!). When I think of “pedagogy” I think of teaching practices. These can be in an official “course” or in another setting where practices that count as “teaching” take place. But “educational practices” seems wider than that to me. It need not have to do with what one does in terms of teaching others, but could have to do with other aspects of what one does as an educator. So, things like reflecting on one’s teaching (and one’s own learning!) in a blog like this would be, to me, an open educational practice…but would it be open pedagogy? I suppose one could say that in doing this I’m “teaching” those who learn from it, but I don’t know if I want to go there. And open access publishing could be considered “teaching” in some broad sense, but it seems to me to fit better under the broader category of open educational practices. Thus, at the moment I’m thinking that in addition to things having specifically to do with interactions with students in an educational setting, OEP could also include open activities such as open scholarship, open reflections on processes, doing one’s own learning in the open, connecting with other educators, students, and others on open networks, and advocacy around open education and open pedagogy. But I’m still not super happy with this, and as Rajiv Jhangiani notes in a Tweet listed below, this is shifting ground. So who knows what I’ll think in a week or so. I also asked people on Twitter what they thought of the similarities and differences. [edit May 2018:] I used Storify to collect them but then Storify died so I embedded the tweets onto a new blog post. Posted in Open Access, open ed, OER and tagged open educational practices, open pedagogy on October 14, 2017 by Christina Hendricks. Hi Christina – I was delighted to find your tweet & blog post. This work consumes most of my time these days as I’m currently completing work on my PhD dissertation on the use of OEP in HE. As you pointed out, OEP is inclusive of open pedagogy. The earliest work on OEP (Geser, Adrade, Ehlers) emphasized the need to move beyond content, but was still focused on using/creating OER. Later conceptualisations of OEP by Beetham, et al, Hodgkinson-Williams, and others are more expansive definition of OEP. In this definition, OEP may or may not include use of OER (at least initially), although it may lead to it. This is borne out in my empirical research also. Thanks so much, Catherine! I didn’t realize that there was a kind of chronological shift in terms of some people still focusing OEP on OER, and then later others being more expansive. I did look at Maha’s post about the Year of Open discussion, and in fact, that discussion is what got me thinking about these questions! I’ll take a look at your own blog post soon. I really am appreciating your work on these issues, both in published form, in slides, and now in blog posts!